A three quarter length full face portrait of a man wearing a white shirt and skull cap, as well as a wrist watch. 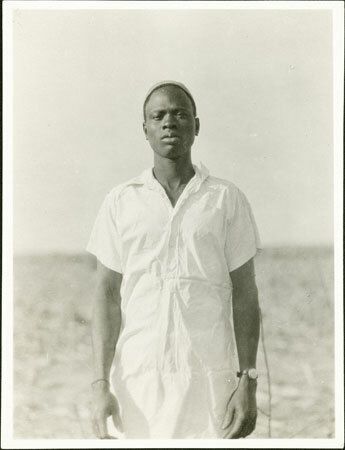 He is described as an Atuot man, and may well be the Atuot servant described by Evans-Pritchard as with him during his first field trip to Nuerland in 1930, and who spoke both Nuer and some Arabic, through which he conversed with Evans-Pritchard. The Atuot lived to the south of the Nuer and are a linguistically and culturally related people to both the Nuer and Dinka. Note on print reverse ms pencil - "B2 76/3 32 "
Morton, Chris. "Atuot man" Southern Sudan Project (in development). 03 Jan. 2006. Pitt Rivers Museum. <http://southernsudan.prm.ox.ac.uk/details/1998.346.32.2/>.